Participation by parents and other family members can expand the reach and success of Farm Fresh Friday events. These fliers outline ways to engage more family members in garden activities. Three steps parents can take to bring Texas Farm Fresh to their child’s school. Tres cosas que los padres pueden hacer para que Texas Farm Fresh venga a sus escuelas locales. Connect kids to Texas Agriculture and introduce them to new foods through garden-based learning. Download TDA’s four-part resource to help you plan, grown, harvest and connect with a sustainable garden. Plan: provides steps for developing educational gardens that can be sustained through changes in staff and participation. Connect: helps develop communication plans to ensure families and community members are aware of educational garden opportunities. For more information on the Let’s Get Growing series visit the Garden-Based Learning page. Farm Fresh Fridays offers a great way for schools to incorporate farm to school activities and celebrate Texas agriculture while teaching students lessons about local food. Use these activity inspirations to plan a local Farm Fresh Fridays celebration. Recipes in Cooking for the Seasons help menu planners meet the meal patterns for the National School Lunch Program, School Breakfast Program, Child and Adult Care Food Program and Summer Food Service Program.The standardized quantity recipes in this cookbook are designed to help you serve healthy, seasonally focused meals that will appeal to your young customers. All of the recipes have been tested up to 25 servings. The recipes are chef tested and kid approved for taste and appeal. This cookbook contains recipes featuring foods that reflect the cultural diversity of the Lone Star State. Children and adults have tested and approved these delicious and healthy recipes. Look for the Texas icon for foods grown in Texas. 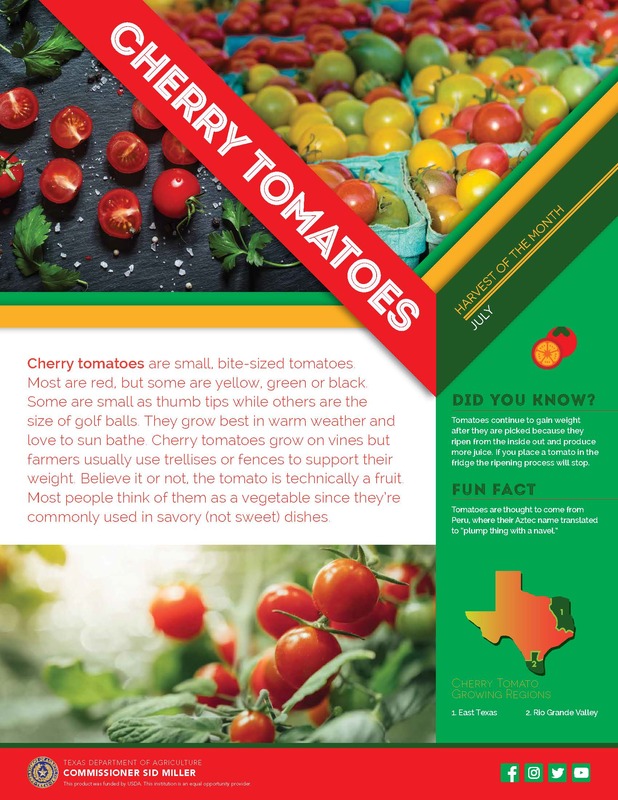 Harvest of the month materials spotlight fruits and vegetables grown in Texas. Posters are designed to be displayed in a K-12 setting. Click here to access valuable educational materials for teaching students and young children about agriculture and nutrition. These educational materials are organized by program type. Choose a curriculum that is tailored to serve participants all year round or pick from many one day activities for a special event.